sur 3 décembre 2014 14 mars 2019 By C. G.
I love clothing that comes in a soft silky smooth fabric. 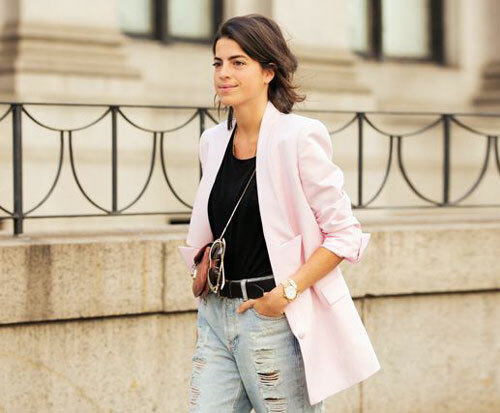 I’ve always wanted a dusty pink blazer and since it was a must-have in my wardrobe, I was looking all over to find one. I did eventually find one a long time ago at H&M, and I like it a lot, but it can’t be worn with everything. The lining is a floral pattern in white and navy blue, the blazer is rather short (for my taste) and the material a bit too stiff. 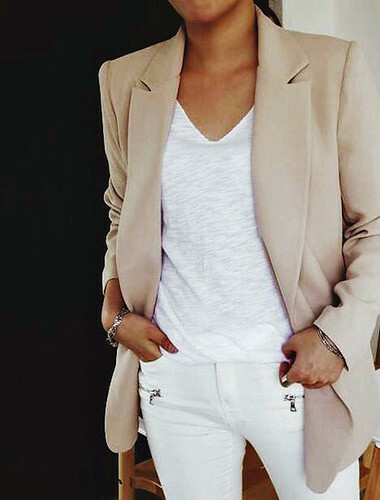 A couple of months ago, while shopping at Aritzia, I found this gorgeous Talula blazer (name of the model is the Kent blazer) for $85. It was a tad bit expensive, but it was everything I wanted so it was totally worth it. Here it is below, followed by a few inspirational outfit photos found on Pinterest. So far I’ve worn mine with black skinny jeans, but I love how it looks with white skinny jeans for spring, and I would definitely try it with black denim cut-off’s in the summer… Speaking of summer, I already miss it!